The What: Crestron debuted its newest additions to the DigitalMedia product family at ISE 2019 in Hall-2, Stand C20. The new products include a DM NVX encoder and decoder with POE+ support, and DM NVX encoders/decoders with Dante audio networking. The What Else: The DM-NVX-E30(C) and DM-NVX-D30(C) are encode or decode-only units that support HDMI connectivity and analog audio. Compatible with all other DM NVX products, they deliver flexibility for basic endpoints when only video and audio are needed. The DM-NVX-E30(C) deliver: high-quality video with exclusive new Pixel Perfect Processing; support for the highest quality formats (4K60, 4:4:4, HDR); PoE+ support; a fan that can be switched off when not in use (ideal for bedrooms); and use of standard switches and Cat-5e cabling. With the new DM-NVX-352(C), the DM NVX product line now bridges the digital audio and video worlds. The DM-NVX-352(C) offer the same feature set as the DM-NVX-350(C), while eliminating the need for complex third-party analog audio devices that receive or transmit AES-67 or Dante audio. The DM-NVX-352(C) connect to analog audio input/output ports on DigitalMedia devices. Now supporting 4KZ (4K60 4:4:4 HDR), the new DM-RMC-4KZ-SCALER-C provides a one-box interface solution for a single display as part of a complete DM system. It functions as a DM receiver, 4K60 video scaler, and control interface, providing a single HDMI output, an analog audio output, plus Ethernet, RS-232, IR, and relay control ports. With a compact, low-profile design it can be installed discreetly behind a display. 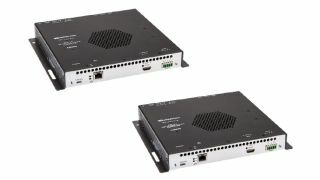 The Bottom Line: Crestron’s new DM NVX encoder and decoder with POE+ support, and DM NVX encoder/decoders with Dante audio networking are designed to provide integrators and end users with additional system design flexibility and functionality.